The Rugby League World Cup (RLWC2017) Organising Committee has announced that fans will be able to attend World Cup games played in Papua New Guinea later this year for just 30 PGK. 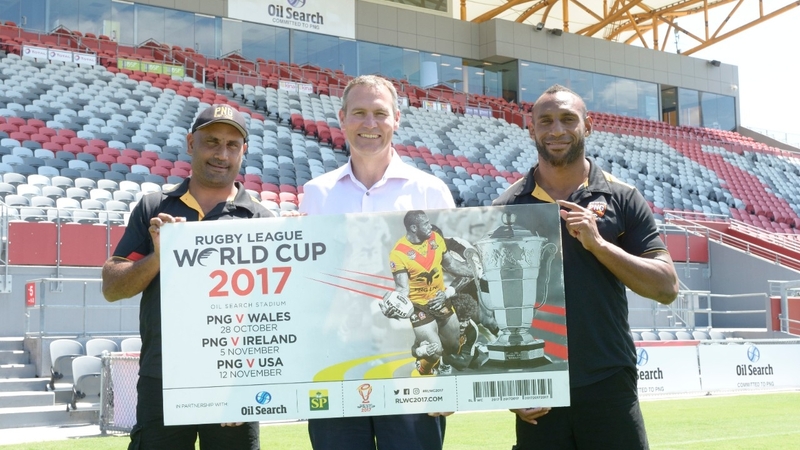 During an event held today at the Oil Search National Football Stadium, RLWC2017 CEO Andrew Hill unveiled the ticketing details and kick-off times for the three RLWC2017 pool games to be contested in the PNG capital, Port Moresby. “When setting the prices for the three Rugby League World Cup 2017 games to be contested in Papua New Guinea, our priority was to make tickets affordable and accessible to as many fans as possible, particularly families,” Hill said. “It was a conscious decision on the part of the Organising Committee to ensure there was a ticket price to suit everyone and provide an opportunity for fans and families to attend this year’s Rugby League World Cup. “This year’s tournament is the most anticipated sporting event Papua New Guinea has ever hosted and we know there is huge demand for tickets from fans wanting to be part of history. The RLWC2017 will be contested from October 27 to December 2 and features 14 nations playing 28 matches in 13 cities across Australia, New Zealand and in PNG.